Life on board the Trans Africa truck with Oasis Overland. 9 months, 28 countries, 1 amazing overland odyssey. We fell in love with St Louis. So much so that by the time our two nights there were over we practically had to be dragged away kicking and screaming to Dakar. I’m not sure it was St Louis itself that we fell in love with so much as it was our campsite, Zebra Bar. Zebra Bar came to us at just the right time. 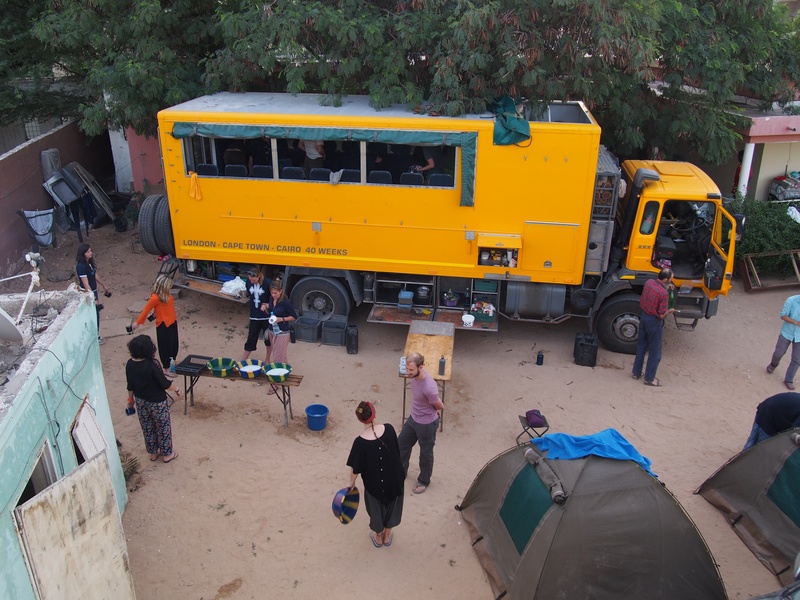 We’d been bush camping throughout the whole Western Sahara, then hit with the heat and dust and chaos of Mauritania – tempers were starting to fray and people really just needed a place to unwind. Enter Zebra Bar, our first real campsite geared towards overlanders. It was right on the river with its own private beach and jetty, a bar stocked with cold (that’s right, cold) beer, hammocks, flushing toilets in which you could actually flush your toilet paper, windsurfing, and occasionally hot showers. In short, luxury. St Louis itself has a real old world charm about it. We took local taxis into town to see what it had to offer and spent the day wandering the local food markets, helping the cook group buy food for dinner, and seeking out every last jar of Nutella that St Louis had for sale. Nutella’s becoming a real truck addiction – one of our girls, Jyoti, bought the last jar in one of the stores, but we must have looked so desperate that the shop owner threw on some sneakers and went running through the markets to try and find us some more. As I write this, myself and Jyoti have a bet going with the rest of the truck that we can go one week without Nutella. Day 3 and we’re already struggling! In addition to satisfying our Nutella cravings, most of us also kitted ourselves out in the famous “Africa pants”, which are now pretty much compulsory attire for all truck parties. Africa pants are EVERYWHERE in Senegal. In fact I’m sure they’re the foundation of the entire Senegalese economy – elasticised, loose, and available in every tacky Africa print possible. They’re amazing. Plus they’re so cheap we’re considering just purchasing a couple of new pairs every week and not bothering with washing our clothes. We joke about it, but give us another week of bush camping and I think it will become a reality. It was a tough goodbye to Zebra Bar on our final morning. Everyone was feeling so relaxed. But the big city of Dakar was waiting for us, we had more visa runs to make, and a mission of a drive ahead to get to Sierra Leone in time for Christmas. So onwards we roll! 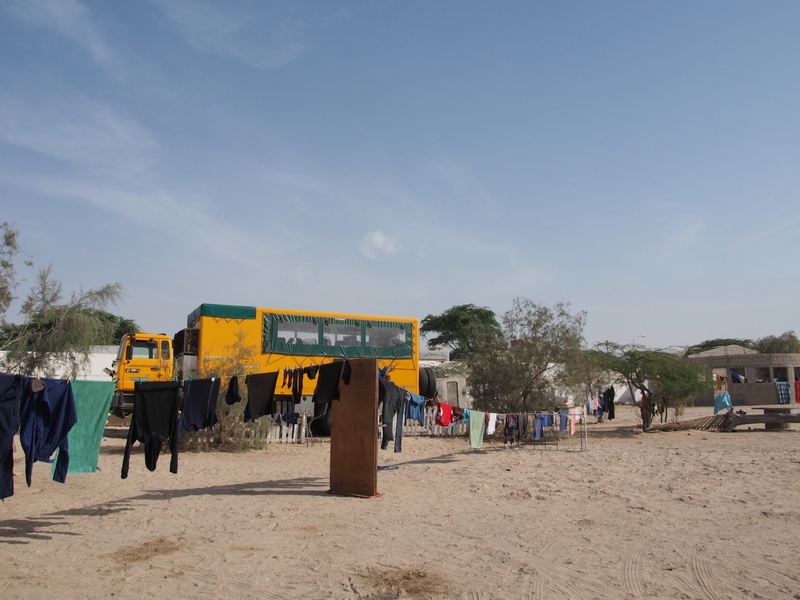 We only had 5 days in Mauritania, and unfortunately much of it was spent driving. Though we did manage to wrangle a full day to explore in both Nouadhibou and Nouakchott. In contrast to Morocco, Mauritania really felt as though we had crossed into “real Africa” – the chaos, the heat, and the women draped in the most beautiful patterned fabrics. Our campsites in both towns were tucked away behind big gated walls. The first we nicknamed ‘Auberge d’construction site’, because we’re pretty sure that’s exactly what it was. The second felt as though we were camped in someone’s front yard, because well, we pretty much were. 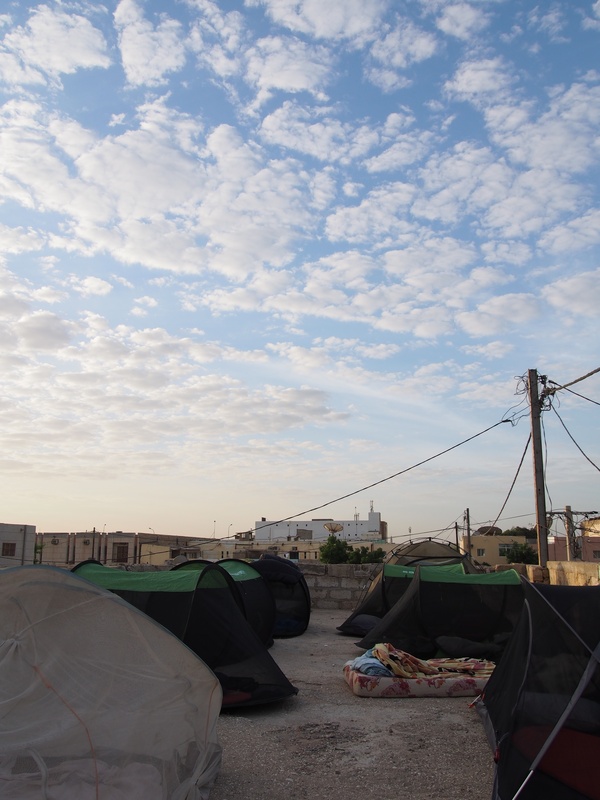 The only way we could fit all of our tents, plus the truck, plus the owner’s vehicles into the campsite was to set up our tents on the roof top overlooking the streets of Nouakchott. Now that we’re in the heat, most of our group are sleeping under the stars in their sansbugs, these standalone mosquito nets, so the rooftop was a shanty town of mosquito netting. Still, it was a nice change from the rocky desert ground we’d grown accustomed to sleeping on in the Western Sahara. 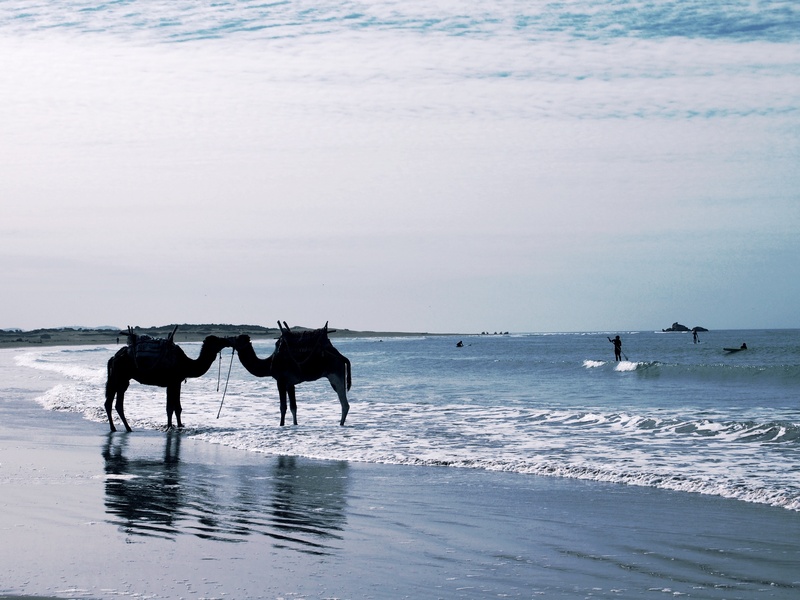 In Nouadhibou, Steve took some of us out on one of his increasingly famous “tourist trips”. We drove out to Cap Blanc on the coastline in search of some special and elusive kind of seals. Apparently there are only 100 left in the world, and Cap Blanc is the only place you can see them. As it turns out we didn’t see them, but we did discover an abandoned shipwreck and for the first time in my life I got to step foot in the Atlantic Ocean! Nouakchott was a much bigger and more chaotic city, and in our free time we ventured out to its famous fish markets. I can’t even begin to describe the scale and energy of these markets as it truly is. The beach is lined as far as the eye can see with a rainbow of painted fishing boats. Fisherman lie asleep or sit smoking and laughing underneath the shade of the boats, watching each catch come in for the afternoon. It’s a melting pot of characters and many of them don’t even seem to work there, they seem to dress up and come down with their mates just to be a part of it all. It would have been great to be able to explore more of Mauritania, and I’ll be keeping an eager eye on how it develops over the years to come. But in just the 5 days we spent there, I discovered a world full of warm, open people who want to welcome you into their country. It’s such a shame that this aspect of Mauritania gets lost amongst the politics. One of the sayings instilled on us at the start of this trip was CYA – “Choose Your Attitude”. You’ll need to remember that a tonne of times along the way, Ishi told us. It’s 3.30 in the afternoon, and we’re sitting in no-man’s land between the Western Sahara and the Mauritanian border – the ultimate of CYA situations. We got here at 10am. Last year’s group was here for 7 hours, but as with the visa run in Rabat we’re not too eager to one-up them on this one. Mauritania is a dry country, so most of the group put in a solid night’s effort finishing off every last drop of our Moroccan-bought alcohol. There are struggling bodies sprawled wherever they can find a spare bit of shade. I’m still recovering from my humiliating ordeal in the Western Sahara so I’ve spared myself the hangover, but I’m not exactly in the best way myself. I’m still not entirely sure how the border works. I’ve been sat in no-man’s land for about three and a half hours now, watching, waiting, observing, and I’m still none the wiser. It turns out that there’s a second no-man’s land to cross before you reach the Mauritanian section of the border. And you guessed it, we’re sat in it. This means we’ve officially smashed last year’s 7 hour record. Yay? I’ve lost count of the number of “officials” I’ve queued up for today. Smiled politely at. Waved my passport to. At least one of them had the decency to propose, so it wasn’t a complete waste of time. Other than that though I’m not sure what any of said officials achieve at each checkpoint. This no-man’s land is straight from the set of Mad Max. It’s a 3km stretch of burnt out, up-turned cars, deserted TV sets and tyres, washing machines, and a mish mash of squatters. Do they live here? I don’t know. Perhaps they were turned away at the border and decided to hang around anyway. Regardless, I don’t fancy spending the night in no-man’s land with them if this process doesn’t hurry up! The sun is setting, the sky is turning dark, and we started our drive from the border with the distinct feeling that this is not a place you should be driving through in the dead of night. But we’ve made it to Mauritania. We have a strange Mauritanian man from the border riding in the truck, directing us to our campsite in Nouadhibou. The shops are all open, despite the fact that it’s after dark on a Friday night and the streets are full of locals buying fabrics, fruits, food, and clothing. Children run after the truck screaming and throwing their arms up in the air, and just about every adult we pass waves with a big toothy smile. If this is the welcome to one of the most taboo travel destinations on earth, maybe, just maybe a 9 hour border crossing is worth it. The Western Sahara was our first real taste of what it’s like to go where few others have been before. It’s desolate, truly desolate. The coastline runs for miles and miles with giant cliffs dropping off into the ocean. Blue water. Surf beaches. Backed by rocky desert and interspersed with giant sand dunes. It’s a really raw kind of beauty. It was also my induction into the much feared overlanding club: The Both Ends at The Same Time Club. That’s right, for 5 continuous hours I was the most violently ill that I have ever been in my entire life. Not holed up in the comfort of my own bathroom. Not with the soothing hug of a Mum. Rather, on a 9 hour drive day through the Western Sahara desert with not so much as a tuft of grass big enough to hide behind, and a truck full of 24 perfectly healthy people who now know me and my bowel movements more intimately than I could ever have imagined. One day I’m going to look back and laugh about the day I was crouched on all fours, hurling violently on the truck tyre, openly weeping, and motioning desperately for someone to grab me the toilet trowel. One day I’m going to look back and laugh about the time I was dry retching out the truck window right over the head of a Western Saharan Police Officer at a road checkpoint. One day I might even look back and laugh at the memory of our driver Steve, patiently washing vomit off the side of the truck door every time he couldn’t pull over in time for me to escape the cabin. 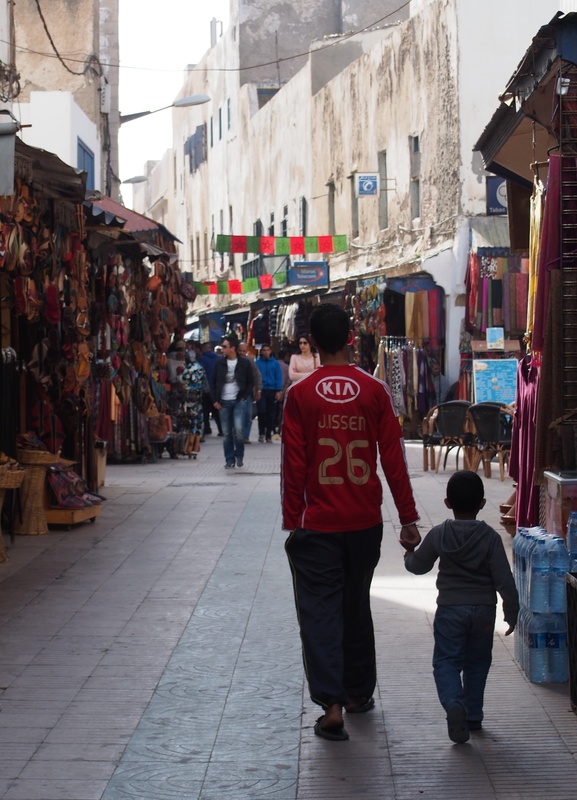 Essaouira is a sleepy little hippy town by the sea. It was our last stop in Morocco and don’t tell anyone in Chefchaouen, but I think it might also be my favourite. After the hustle and bustle of Marrakech, Essaouira was the perfect place to unwind and to regather ourselves before we tackled the Western Sahara. I may be a little bias about Essaouira because it was here that I scored my first hot shower since Fez (two weeks before). But whatever the reason, walking along the beach from our camp site to the medina in the centre of town, I couldn’t get the grin off my face. I’ve loved every minute exploring the mountains and deserts of Morocco, but I’m a creature of the sun and there are few things more wonderful than the feeling of sand between your toes. With the desolation of the Western Sahara and Mauritania on the horizon, I used Essaouira as an opportunity to gorge myself stupid on all the foods that I knew I’d be leaving behind in Morocco: beef and vegetable tagines, Nutella crepes, chocolate eclairs. You name it, I ate it. Essaouira is famous for its seafood – you walk out of the old town and down to the seafood market where rows of stall owners shout for your attention, shove giant crabs in your face, and try to assure you that their seafood is in fact the best. You pick out what you want from a giant tray of fresh seafood and they grill it up for you on the spot. I gorged myself stupid (again) on baby octopus, whiting, and king prawns, and headed back to the truck one very happy camper. It’s hard to say goodbye to the free wifi, hot showers, endless supply of Nutella, and Marjane supermarket trips – but after three wonderful weeks in Morocco, we’re well and truly ready to leave the tourist trail behind and get off the beaten track. From here on in we head into ultra-conservative territory, and we’ll be some of the very few westerners who travel this road for the entire year. It means we need to keep our heads downs and just keep rolling until we get to Senegal. We’ve been asked by Oasis not to update the Internet with our location so we can fly under the radar as much as a giant yellow truck possibly can. “Long and loose” is the dress code, and thanks to a rather indulgent night camped at the base of a sand dune, we are all entering dry Mauritania ready for a 4 night detox. Its going to be a world away from Morocco, but we’re ready! We left our peaceful little oasis at the Todra Gorge to head for bustling Marrakech, the polar opposite. 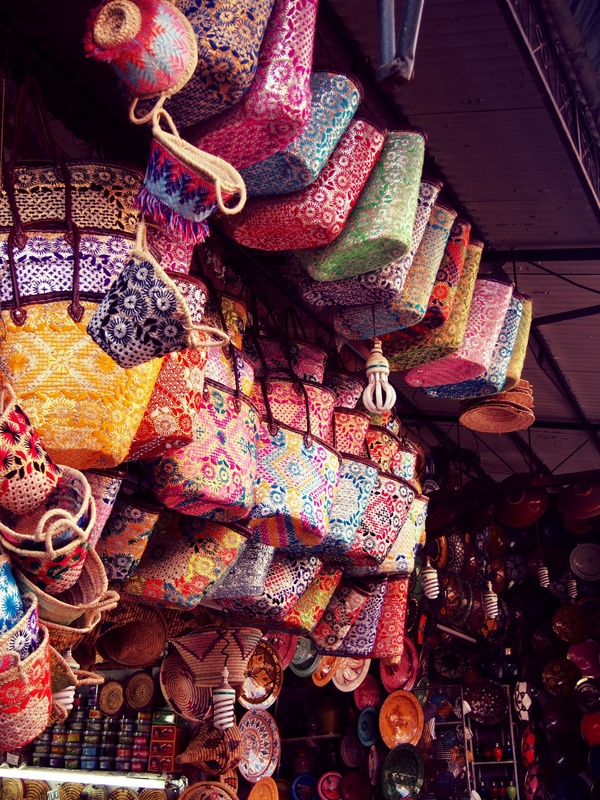 Marrakech really epitomises Morocco for me – the colours, the buzz, the stall holder banter, the constant smells of oils and leather and spices. It’s a total sensory overload and it’s impossible not to get caught up in the excitement. 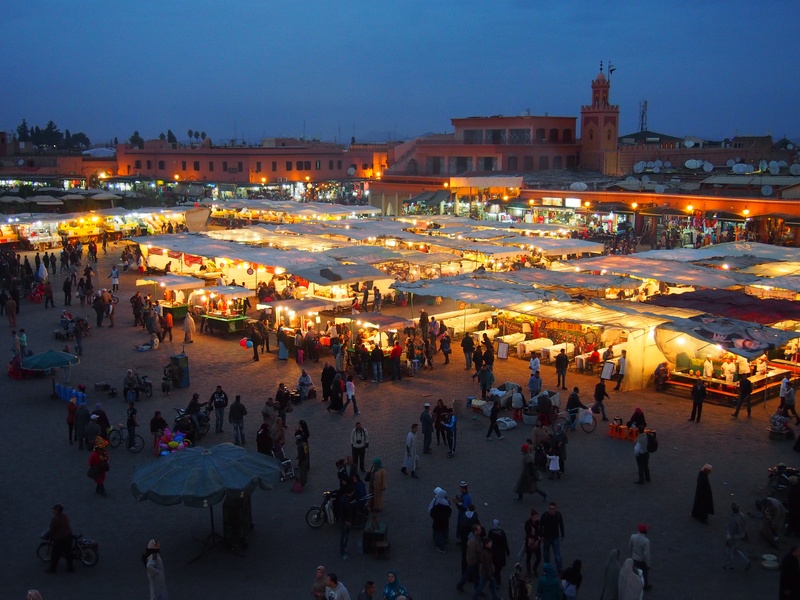 We had two nights here and spent all of our spare time exploring the markets around Jamaa El Fna. 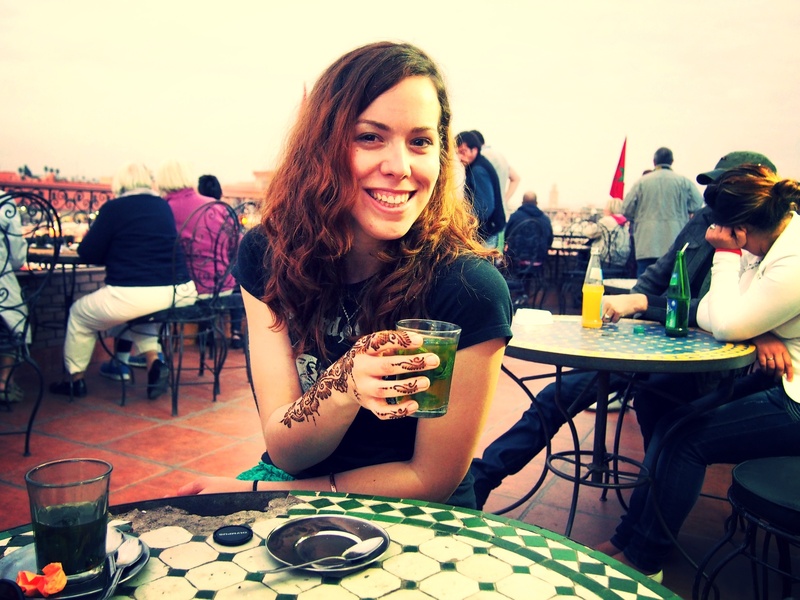 I filled in my days haggling with shop owners for souvenirs, scouring the antique stores for my secret Santa gift, downing freshly squeezed orange juice, and trying to avoid being accosted by the snake charmers in the main square. I had a bad experience involving a python in Vietnam, which ended in actual tears, so every second I spent around the snake charmers was a second spent on edge. It doesn’t help when you see unsuspecting tourists with snakes rammed down the front of their shirts or wrapped around their heads while they’re trying to take a photo. But I survived! Vibrant. Intense. Electric. Fast moving. A full day in Marrakech leaves you feeling as though you’ve run a marathon and then been hit with a steam train. But as exhausting as it is, it is also an incredible adventure. The drive from Rabat to the Todra Gorge is mesmerising, like most of the scenery in Morocco. We drove over mountain tops through rain and snow then came out the other side into seemingly barren desert. You drive through kilometres of nothing, only to go over a hill and find yourself staring into a lush green oasis town. 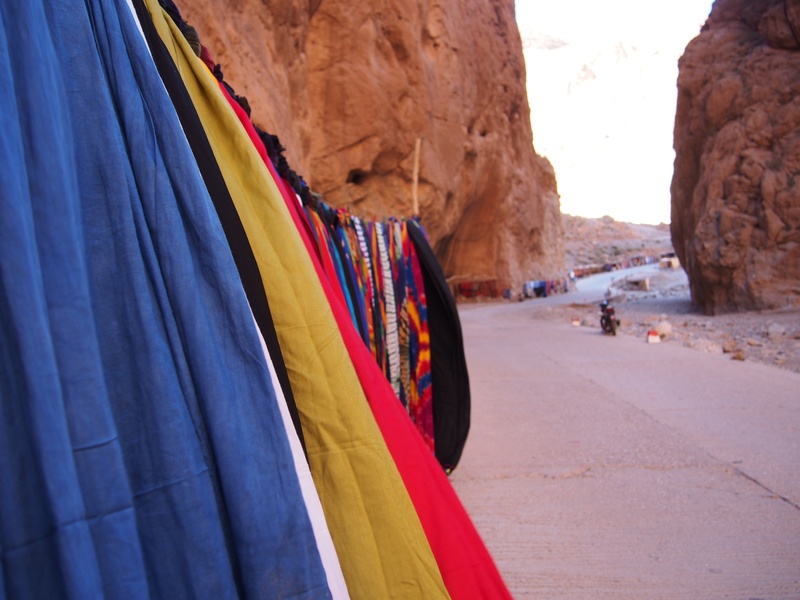 The Todra Gorge turned out to be a welcome vacation after the monotony of Rabat. I’m almost ashamed to admit the part we were most excited about though. The hotel we were supposed to be camping at let us spend our two nights there sleeping inside a massive dorm room. That’s right, we got to sleep indoors! The showers were cold, and they turned off the electricity so the toilets only flushed for a couple of hours a day, but we got to sleep indoors! The hotel was nestled right at the bottom of the gorge, in between two cliff faces and sitting alongside a stream where we spent our first afternoon washing clothes. We must be quite the sight with our big yellow truck and having not showered in about 5 days, because a bus load of European tourists pulled up and started taking photos of us washing in the stream instead of taking photos of the gorge! We spent our two nights here drinking coffee, reading, watching movies, wandering up the road to the villages nearby, and indulging in cheap Moroccan wine. It was exactly the time out that most of us needed – no early wake ups, no packing up tents, no need to be anywhere. On our second day in the Gorge, myself and some of our group decided to drag ourselves away from the cosiness of the dorm room and tackle a half day hike of the gorge. I can’t say I was super confident when our tour guide rocked up in jeans and a cardigan, looking all of about 16 years old. But we managed to go up the mountain and come back down the other side with all of our people in one piece, so he must have had some idea what he was doing. We walked up and up and up for about and hour and a half, right through a rain cloud. The fog was so thick that we couldn’t see more than a few people in front of us for much of the way. It was an eerie kind of beautiful, and although we didn’t get to actually see much of the gorge it sure helped us work off our daily kofta roll and tagine addiction. There are camps of nomads scattered throughout the mountain tops. Every day they walk down to the creek outside our hotel, fill up water bottles, and begin the long hike back up to the top. It was bitterly cold when we visited them, and it’s hard to comprehend that anyone could survive up there. But they do. It’s a whole world away from the life I know in Brisbane. 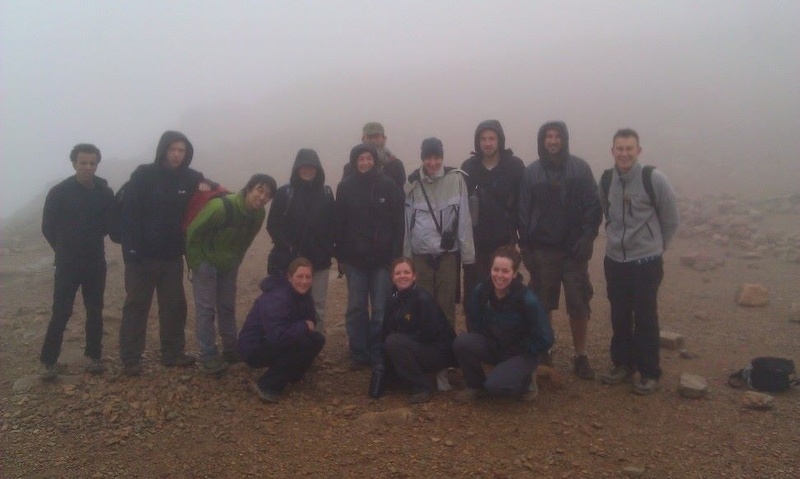 Graham Askey on Kenya dig it? jessicaleemonk on Kenya dig it?